It was fascinating to see the cover of this month’s Print Monthly Magazine showing an operator working diligently at his Intertype machine. When I first joined the company back in 1988, we were still using the old Intertype machines to set lines of text for printed labels. Actually, I remember a visit to the British Museum and my father commenting that the Intertype machine they had on display there was actually newer than the Linotype machine he was using at the time! What Is This Printing Machine? For those that don’t know (and many won’t as these machines were confined to noisy newspaper factories predominantly), the Linotype machine revolutionised the type setting industry, as it could set a “Line o’ Type” as a solid line of lead/tin alloy which could then be placed.in a chase instead of each letter, space and number being inserted separately. The machine itself was extremely impressive to see operating when it was working well. A central shaft controlled a series of cams and cogs which would revolve perfectly in time to operate the plunger to squirt the molten metal into the molds, bring down the arm to retrieve the brass matrices and move various other parts of the machinery round. Although the keyboard had similarities to the modern QWERTY keyboards, it was laid out with lowercase letters to the left and uppercase letters to the right. It was only possible to select one typeface and point size per line of text, although bold/italic could be mixed in. I still remember having very tough skin on my thumb and first finger from picking up the hot slugs up and examining them. Inevitably time moved on and the machines were sent off for scrap, but we do still have a magazine of matrices kicking around the factory – I’ll never let those go. Instead of three typesetting machines, we have various PC’s and macs setting lines in infinite point sizes at the movement of a mouse. 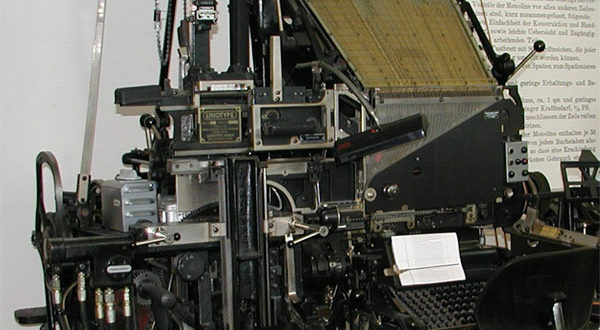 We also allow customers to set their own labels online, but the site of this is nowhere near as impressive as the old noisy, smelly and darned awkward Linotype and Intertype machines!